Fioretto juniors excelled this year in the National U15 and U17 championships. 6 of our juniors took part, all U15 athletes, and no one came home empty handed. 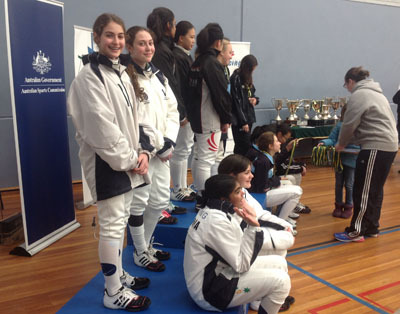 Our 2 U15 women's foilist made the VIC A foil team after solid personal performances, and helped the team to Silver against Singapore in the Teams comp final. The men's foilists and epeeists were not to be out done either! President Brook Dunstan General direction of club activities and guidance for club members. Treasurer Lulu Fowler Financial management including membership fees, club revenue and expenditure and Fencing Victoria fees. Vice President/ Member Protection Officer Damon Fowler To assist the president in managing the club's activities through ensuring that a safe and respectful club environment is maintained. Secretary Joanne Montgommery This person is responsible for receiving and recording any official information relating to the running of the Club. Tournaments Officer Michelle Goldenberg Responsible for keeping up with tournament news and distributing timetables and organising DT teams for duty. Fencing Victoria Rep' Anne Nuguid Represent club at Fencing Victoria meetings. Editor Brook Dunstan Responsible for the publication of all internal news on a quarterly basis in the club newsletter. Publish news articles to the club website regularly. Assistant Editor William Dunstan Assist the Editor in aspects of the publication of the club newsletter. Webmaster Brook Dunstan In charge of website development and maintenance. 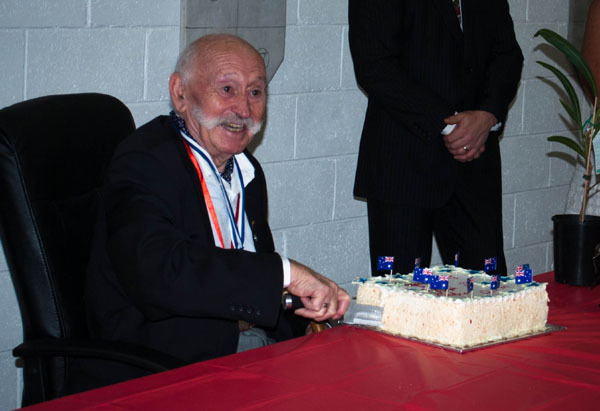 It is with great pride that Fioretto Fencing Club announces that Maestro Jospeh D'Onofrio was awarded the O.A.M. (Order of Australia Medal) on Australia Day, 26th February 2014, in recognition of his service to the local community and to fencing since he immigrated to Australia as a young man. It was fitting that a reception morning tea was held at Fioretto Fencing Club, his pride and joy, on the 15th of March to celebrate his acheivement. Guests included Anna Burke, Bill Pontikis (Monash Council) and Simon Auty (President of Fencing Victoria), with many other apologies and letters sent in. Most importantly Maestro's children and grandchildren were all there to share the moment with him.